Barcelona looks lovely in the late winter, and so it is that 2012 F1 cars gleam in the yellow sun, starbursts of florescent orange, or a deep aquatic blue suddenly catching the shaded eye. 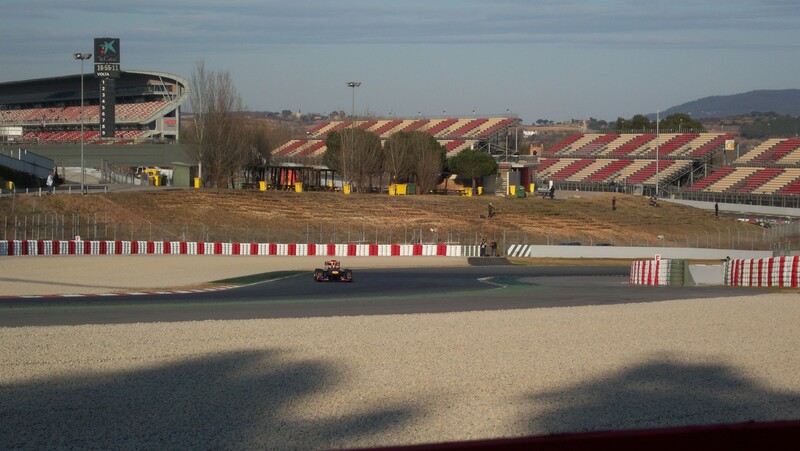 For all that, I actually found it quite difficult to see the cars in action on Tuesday, February 21. I headed straight for Turn Nine of course, because I love to watch F1 cars swallowing blind, fifth-gear corners, but I came away confused. Lewis Hamilton flew through first, in that chrome-and-orange -“No plans to change the nose at this stage” – McLaren – and he was impressive enough: he tore into the corner without a lift in fifth, then grabbed fourth two-thirds of the way through it, as the tyres scrubbed away speed. Astonishingly, though, Nico Hulkenberg , to my eye, looked every bit as good at this point of the circuit in the Sahara Force India – as did Fernando in the Ferrari. It was only when Bruno Senna appeared in the Williams FW34-Renault, car understeering pretty much from entry to exit, that I could see the first three in any kind of relief. On the plus side, they were all mind-blowingly quick – quick, neat and very, very tidy. I didn’t see Daniel Ricciardo on the limit at this point, but I did see him grind to a halt right in front of me. Good, I thought, he’ll climb out and we’ll have a bit of a natter. Not a bit of it. He stayed strapped into the cockpit of the STR7 until “help” arrived – help in the form of fire marshals, track marshals, two circuit vehicles, a lifter-truck and a bunch of STR mechanics. Excellent, I thought: they’re going to fix the broken throttle or the duff electrics and send him on his way. Not a bit of it. The bulk of the next 15 minutes were spent covering the car in a blue cover and raising it carefully onto the back of the truck. By this point Daniel had magically disappeared and had returned by car to the garage. I stopped by the STR boys once the day was over and asked surreptitiously about the cause of the problem. The response, after much deliberation, was the earth-shattering news that it had been “a technical issue”. 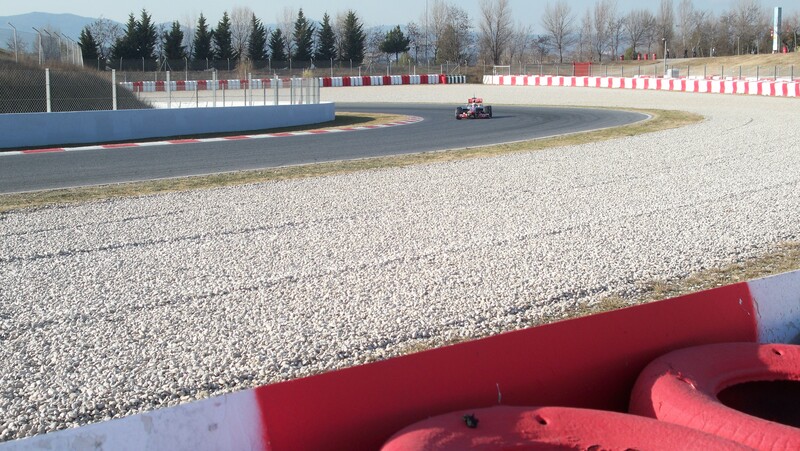 F1 teams – even the mid-fielders – are today paranoid about “secrecy” – more’s the pity. If I had to guess, I’d say that they ran him out of fuel. That’s what it looked and sounded like – and so that should be taken into account when assessing the STR times from Tuesday. Anyway, back to the lap. The approach to Turns seven and eight (the left and then right flick at the bottom of the hill) is usually quite fun but today was again strangely neutralising. Charles Pic looked pretty good in the Marussia at this point – as did Bruno. About the most noticeable thing, as they came off the power and dived into the left, was the exhaust note of the McLaren. It still has a distinctive rasp, I’m pleased to say. Turn Five is the very slow left-hander. 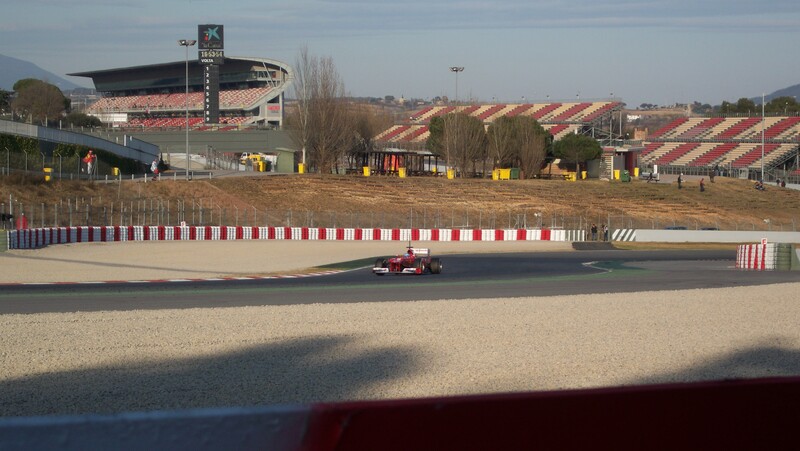 I didn’t stay here long, because the viewing angles weren’t right, but I did see Sebastian Vettel, all balance and timing, suddenly light up his left front Pirelli and run wide. Ha! A Vettel mistake! 2012 has begun! 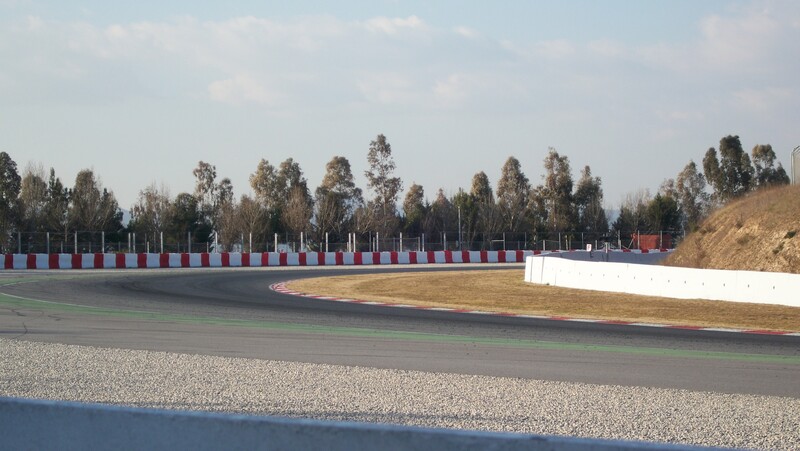 Turn Four is a nice corner – a long, long third/fourth gear right-hander with a long enough piece of straight road on exit to make it a key ingredient of the lap. 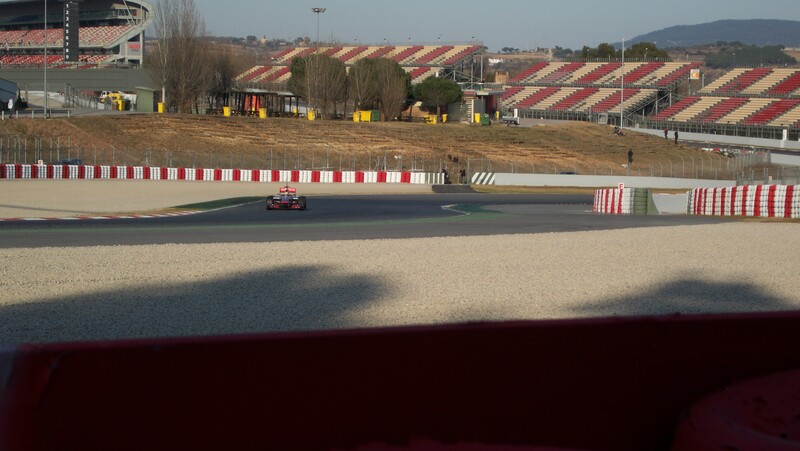 Again my viewing angles were imperfect but here, mid-corner, it was at least not difficult to see the genius of Lewis Hamilton. This corner is all about rotating the car at precisely the right moment (which by definition is different from lap to lap, of course) and using the steering and throttle to produce a twist in the car mid-corner – all a function of having exactly the right amount of brake pedal pressure at the initial turn-in point and finding exactly the right minimum speed. In Lewis’s case, the result was a McLaren that mid-corner was pointing virtually straight towards the exit, giving him a nice, clean run onto the straight with the minimum of load. Lewis would probably say that he has too much oversteer here; my point is that he used that oversteer to his advantage: he managed it perfectly. 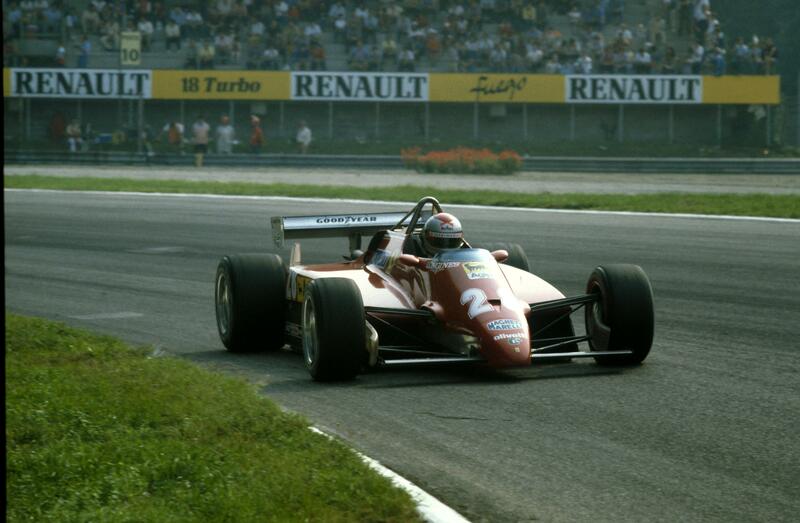 With Bruno, Pic and Perez (the only other drivers out when I was watching), there was telltale mid-corner understeer, a sure sign that too much had been asked of the loaded front in the first phase of the corner….which in itself can be traced back to the initial steering and brake pedal movements and pressures. 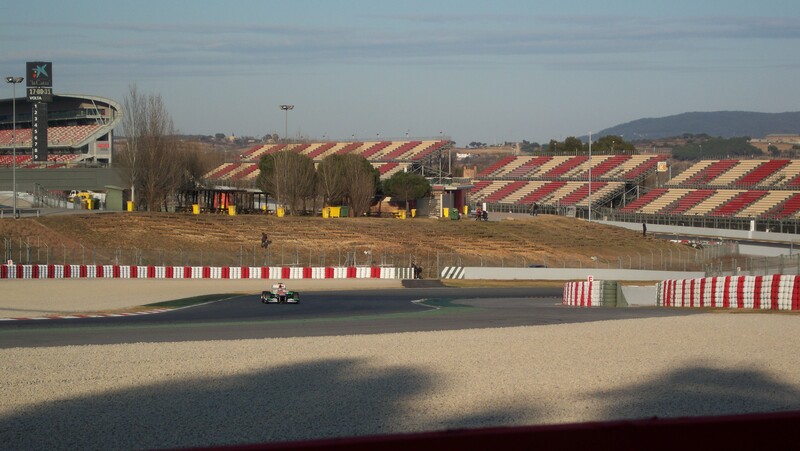 I’ve never watched from the famous Turn Three at Barcelona, so here was my chance. 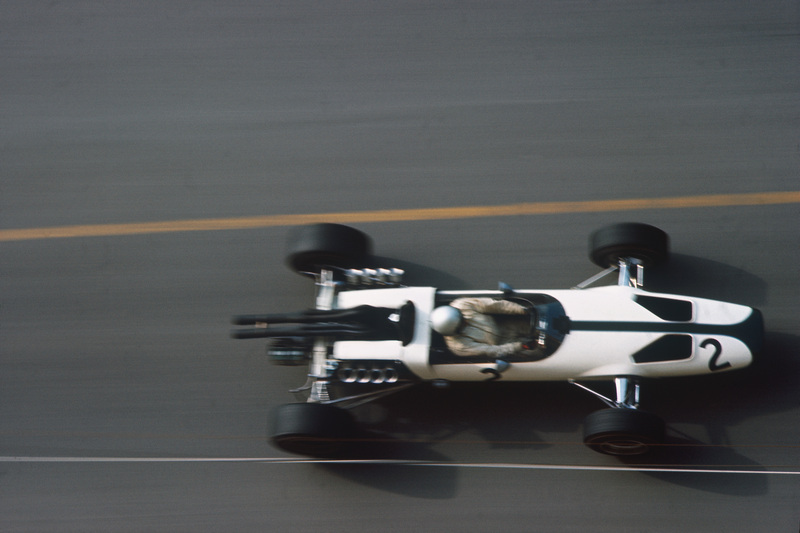 Many drivers in the past have claimed to have taken this very fast right-hander “flat” on a pole lap, or on some desperate lap near the end of a race, on light tanks, but of course we’ve only ever had their word for it. How would Turn Three greet the 2012 F1 cars? Well, the good news is that it isn’t “flat”. Not from what I saw and heard this Tuesday, at any rate. (I suspect that most of the quick runners were carrying quite a lot of fuel and that Three might indeed be lift-free when the cars are lighter.) Indeed, I hadn’t been there long, chatting to the marshals and waving to the eight spectators behind me – the eight fans behind me – when Heikki Kovalainen suddenly ran right out of road and kicked up the exit dust in the run-off area. 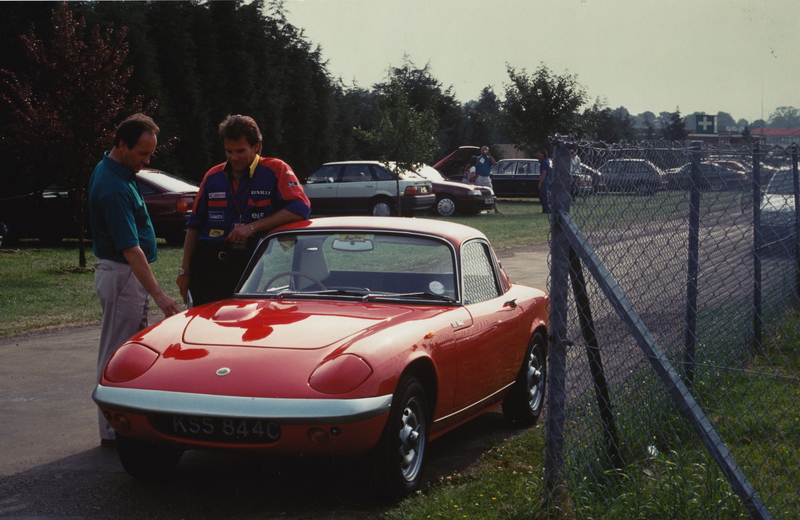 I pictured him telling the engineers later – should they have asked him about it – than he had just “run a bit wide”. In reality, I thought, as I watched the sunset and awaited the last 30 minutes of testing, this was the sort of mistake that probably cost Peter Collins his life at the Nurburgring in 1958. Racing drivers have been “running out of road” for as long as they’ve been sitting behind the wheel and pressing pedals. It’s just that there’s no penalty these days and the matter is very quickly forgotten. 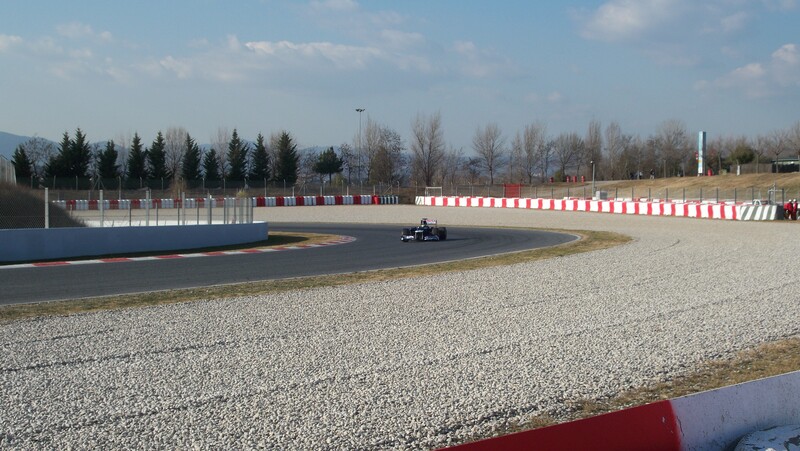 Finally, then, I found the right place to watch in Barcelona: it is on the outside of the track, on the section just before Turn Three. You see them exiting Two (a left-hander) in third gear before a very tricky direction change for Three. The more stable the platform for the car into Three, the better your chances of manipulating the forces through to the corner’s exit, and therefore to the longish straight that follows it before Four. Again, Lewis was peerless at this point, as I think the adjoining photographs show. Whilst Ferando Alonso darted almost back to the centre of the road before giving the Ferrari his signature flick into Three, Lewis kept the McLaren much straighter on exit, freeing the car of load, and was then much less ambitious with his turn-in territory. Given the radius that Fernando would proscribe, how did Lewis get the McLaren’s nose to tuck into Three? By superbly soft initial steering inputs and velvety use of the throttle. Fernando was on full power sooner than Lewis but I daresay Lewis was quicker, thanks to the load he wasn’t thrashing through the car, about 50m after the exit of Three. Seb Vettel was great to watch here, too: he chose road between Lewis and Fernando, with an aggressive flick to the left from the exit of Two, but then made a very gentle turn into Three. I suspect that the RBR8 already has a little more bite than the McLaren – thus Seb’s ability to jink the car almost at will. I should add, of course, that the Ferrari also has plenty of grip: there’s no way Fernando would be doing what he was doing into Three if he was driving a bus. Or a Ferrari 150th. Nico Hulkenberg also looked very good here, as did Heikki Kovalainen (yellow wheels aside). As on the other corners, Perez and Senna just seemed to be asking too much of their cars, weaving them out almost to the centre of the road before giving them lots of steering input for Three. They were fun to watch, of course – but were a world away from Lewis at this point. Fascinating, thank you. Good to see that Macca have a good car from the start. Yes – I think the McLaren boys are in a bit of a daze at present, stunned at how much good, early running they are managing to achieve! Thanks – always fun out on the circuit! I was just listening to your discussion on this topic with Scarbs on TFL and I agree with you wholeheartedly about Melbourne’s lack of “technical” viewing spots. I look forward to walking the corners during practice and qualifying and tend to stick to the last sector from Turn 11 thru to 15 as they tend to push a little harder here. Adelaide was a much better venue for trackside viewing. I’ll never forget the last minute qualifying duels there especially between Senna and Prost. I remember looking straight on at what would have been 12 & 13 (the short right,left,left after the hairpin turn at the end of the straight) and watching Ayrton’s car “shaking it’s head” trying to find front end grip in contrast to Prost’s smoother more deliberate approach. Ayrton was quicker, but only by a whisker! Hi Peter! More of this from Mugello testing please!